The snake catchers of Alice Springs rush to answer residents' cries for help - to ensure the safety of the reptile causing the panic. If you discover a snake at the bottom of your garden and you live in Alice Springs, don't panic - just send for the snake catchers of the Alice. There's Bruce Munday, an incredibly laid-back, fiercely mustached chap who will come to the rescue as quick as a flicker of fang. 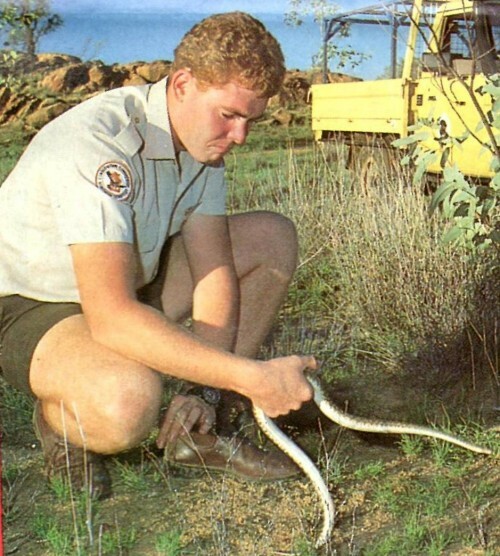 Or there are the rangers of the Northern Territory Conservation Commission (NTCC), big willing fellows who'd rather face a snake any day than a nasty bush litterer. Bruce, an animal keeper at Alice Reptile World, and Greg Fyfe, head ranger stationed just out of town at the historic Telegraph Station, filled us in on the reasons behind the creepy service they offer residents. "We're really more interested in protecting the snakes than the people," Greg explained dealing a blow to the human ego/ "It's illegal to kill snakes in the Territory, but if they're found within 100 metres of your home, that law doesn't apply. It's considered a life-threatening situation, so frightened people start whacking." Bruce agreed. "You have to get there in a hurry or it's curtains for the snake. I had one hysterical woman screaming at me as I approached, " Hurry up or I'll dong it!" It was just a baby western brown, but a chap was there fending the poor little devil off with a broom. "Another chap walked into the reptile house one day clutching a small, dead legless lizard that looked as if it had been run over by a Sherman tank. He'd seen a lot of them around the place and wanted it identified. "The trouble is, with most people anything that hasn't got legs is a deadly king brown or a death adder out to get them," he said. They can "get" them, too. Like most Australian snakes, the snakes of the Centre are highly venomous -- death adders, eastern and western browns, vicious tiger snakes and a few others. "It's safer for people to call in snake catchers than tackle them themselves," Greg said. "You can't be too gung-ho about it, either. I've been almost bitten by an eastern brown because of carelessness. "Anyone trying to kill one of these fellows could be in trouble. They're big, nasty and very fast. They stand their ground, up in a typical aggressive S-bend, mouth agape, hissing like mad. "Most people call us or Bruce or the wildlife people. We place an advertisement in the local newspaper every now and again, telling people to get in touch. It's better than taking risks." Most of the serpents the snake catchers caught are taken well out into the bush and let go. A few are kept for educational purposes. "Sometimes we get an interesting snake and keep it for a while to do talks to kids at schools. We let them pat the snakes and teach them that they're not slimy creatures," Greg explained. Bruce keeps a few "magnificent specimens" to add to the reptile house and uses them in talks to groups on the correct method of treating snakebite. "There are two basic principles," he said. " First you put pressure on the skin over the bite by binding it up and splinting it to keep the limb perfectly still. Then you get a doctor as fast as possible. Don't do ant barn-dances on the way and save the whisky for after the cure. If a bite is treated this way, it can take at least seven hours for it to be fatal." In the Territory as a whole, Greg says, the rangers get about 800 call-outs a year. Some of these are to tend injured birds or animals, but the majority of calls are for snake catchers task. "You get snakes in the house, in swimming pools and in gardens," he said. "You even get them in the street." Not infrequently, the troublemakers are snakes which have been kept illegally as pets. "We picked up one 3-metre olive python that must have come illegally from Queensland," Greg explained. "The suspicious large bulge in his belly turned out to be the caller's prize duck. However, we never did catch the snake's owner." Poultry yards and bird cages are favourite restaurants for snakes. They track down their prey by picking up scent particles in the air, home in, have a feed and can't get out because they're fatter than when they slid in. Both Bruce and Greg are snake buffs (snake catchers in the future) from way back. As a youngster, Bruce delighted in catching copperheads on a golf course near where he lived in Tasmania, and scaring his mother silly. Greg was doing pretty much the same on the mainland. Trainee ranger Peter Mckenzie, who works with Greg, got his training in courage and cunning by pinching crocodile eggs around Darwin, so snakes don't scare him. "We'd take the eggs from nests that were likely to be flooded and the eggs lost, then incubate them," Peter said. Snake Catchers job or pinching croc eggs -- it's a sure thing not too many will be trying to take the jobs from these intrepid fellows!